When something comes along and breathes life into a staid industry, but has not had time to establish deep roots, we should be careful to preserve it. Blogging has challenged the media. Every week, bloggers rail against sloppy journalism. For perhaps the first time, there is a democratic and immediate response to any weak-minded argument that makes it onto the pages of a newspaper. It’s David and Goliath stuff, and its refreshing. Nobody knows how the relationship between blogs and media will develop. 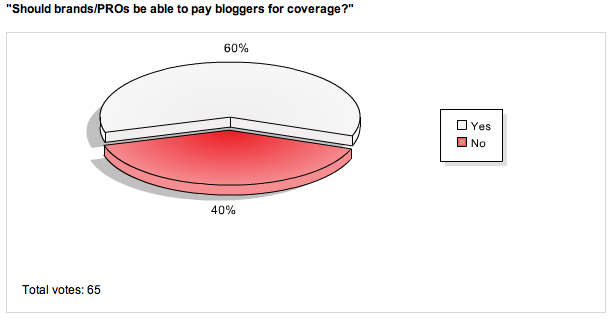 So far, it seems bloggers are becoming more skilled and better resourced, potentially challenging journalists. Meanwhile, most journalists I know are being asked to blog as well as write (or, from their perspective, being forced to write more for the same money!). But the critical difference is that bloggers have not been confined by commercial interests from calling things the way they see them. This is liberating, and is something the mainstream media, with its vested interests, can never hope to compete with entirely. Which is why its disappointing that it appears blogging is becoming tarnished by a lack of transparency. In a nice post last weekend, Laurence Borel asked the question – should bloggers be paid to write blog posts? It’s a multi-layered question. Firstly – why not? Good bloggers should be paid, just like good online media should be paid-for. But the big question is about transparency and the flow of money. The money should flow from the consumers of the blog, rather than from brand owners or companies. Otherwise it reduces blogging to advertising – undisclosed advertising. This would be no more acceptable than if an ‘expert’ sold you a mortgage without telling you they were paid to sell you that particular one. Transparency is the big issue. We should value the independence of bloggers. Sadly, the credibility of all bloggers will be damaged if there is a perception that they are taking money from the brand owners and companies they blog about. This is why it’s so important that we don’t allow this practice to take hold. And why it’s so depressing to see that the majority of PR people in the UK have got this one wrong in a PR Week poll. The emergence of social media presents an enormous opportunity for the communications industry. There has never been such demand for watertight strategy and precise implementation of complex and increasingly targeted communications campaigns. The PR industry should be nurturing social media, not trampling all over it. Under pressure from the media on the one hand and encroaching regulatory scrutiny on the other, blogging is fragile enough. Let the PR industry take a lead in setting out best practice. Best I mention first off – this blog won’t be all about morality, though it may feature from time to time. This blog will meander but is likely to include stuff about economics, science, marketing, social media and communications, as well as things that are, well, just funny, in my opinion. And this – my opinion – will likely feature heavily too (if I know myself). So with that said, let me get to the subject of this post. I was discussing recently with a great friend the subject of how we make moral judgments, when I was reminded of a brilliant piece of work last year by a team of neuroscientists in the US. These scientists were looking for a scientific explanation for moral judgments, and designed an experiment where they measured the brain activity of various subjects while they were asked to make moral decisions. They posed a classic dilemma: you discover a train is hurtling down a track and will kill five people who are in the train’s path further down the track. In the first scenario, you are offered the choice to pull a lever that makes the train reroute to a different track, where there is one person on the track. In other words, you can act to save five people by killing one. As brutal as it sounds, most people end up agreeing they would pull the lever. The neuroscientists analysed brain activity as people made this calculated judgment. In the second scenario, you are offered the same choice – to save the five by killing one – but this time you have to push someone under the train, slowing it down so it stops before reaching the five. Most people, when offered this choice, feel that they should not intervene, even though the outcome is identical (in terms of lives saved and lost, anyway). The experimenters examined which parts of the brain were being used to make this decision, and found one area that came alive with electrical signals when they made the decision whether to push someone under the train. In other words, in most cases some brain function seems to have overruled our calculated view that one death to save five is better than five to save one. The quite comforting conclusion is that, while we are able to make calculated moral decisions even where they involve purposefully killing someone, we seem to have evolved to not want to do things like push other people under trains. Thus backing up my deep optimism towards human nature.